Dough-mixing can be very hand when you use C.P SRL 40E Planetary Mixer (40 kg). It is a reliable mixer when preparing your creams, sauces, cakes mixes, and batter. This dough mixer is a must-have for caterers, commercial kitchens, restaurants, pizza stalls, and bakeries. This high-quality and functional mixing equipment can be switched on and off using a mechanical timer. It comes with a modern motor that has an automatic belt speed variator that uses a high-transmission ratio. Its speed can be adjusted to low and high with an evenly distributed machine speed. The bowl can carry 40 kg in maximum storage. For easy cleaning, it uses a stainless steel grid that can be removed. It basic parts consist of blade, spiral, and whisk. The frame is made of a thick painted steel and stainless steel base. 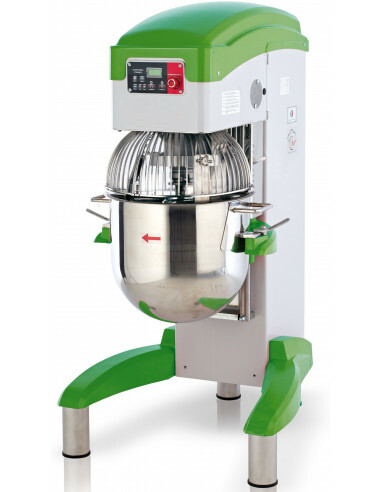 C.P SRL 40E Planetary Mixer (40 kg) is a durable dough mixer to fully blend your ingredients and produce quality finished products.